If you’re looking for a new mobile game to try this weekend, there are lots of new options for you to try, including Independence Day: Resurgence—Battle Heroes, a strategy game from Zen Studios. The game is based on the upcoming film Independence Day: Resurgence, and it challenges players to defeat aliens in turn-based battles. In addition, Vizor Interactive launched Zombie Castaways this week. The farming and simulation game allows players to plant crops, construct buildings and more on a series of tropical islands. 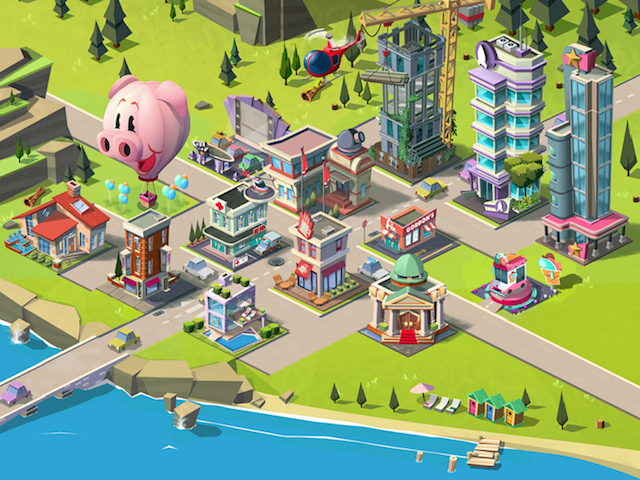 Build Away (Free on iOS, Android) – This idle game from Futureplay Games asks players to tap or swipe on buildings to collect money for their towns. As players collect money, they can construct new buildings or upgrade their existing buildings to generate more money over time. As players progress, they can add power to their buildings, so the buildings will continue to generate money even when users aren’t playing the game. Cristiano Ronaldo: Kick’n’Run (Free on iOS, Android) – This soccer-themed endless runner from Hugo Games asks players to help soccer star Cristiano Ronaldo survive as long as possible while running through busy city streets. Players can swipe to change running lanes and jump over or slide under obstacles. These obstacles may include enemy players, who will try to attack Ronaldo as he runs. In addition, players can tap on the screen to kick a soccer ball at some obstacles, which may clear the path for Ronaldo to keep running. Gamers can collect coins as they play, and can spend these on new clothing items and shoes for Ronaldo, upgrades for the game’s power-ups (coin magnets, shields, etc.) and more. Seven Guardians (Free on iOS, Android) – This strategy RPG from 4:33 Creative Lab allows players to control heroes in seven different classes during battles. During each battle, players spend energy to deploy units onto the battlefield, and these units will advance and attack enemies automatically. In between battles, players can recruit new heroes for their armies. Users can upgrade their heroes, or equip them with new gear to make them stronger. In addition to a level-based single-player campaign mode, Seven Guardians features player-vs-player battles, guild raids and more. Take Off: The Flight Simulator ($2.99 on iOS, Android) – This flight simulation game from astragon Entertainment and jujubee allows players to explore eight islands of Hawaii in an open world free flight mode, and also complete campaign missions including transport tasks, tourist flights, rescue missions and emergency landings. The game also includes a management mode, allowing gamers to send planes to 21 airports around the world. The game includes 14 different aircraft, and it allows players to choose from multiple camera angles while flying, including a 3-D cockpit view. Light: Fellowship of Loux (Free on iOS, Android) – This RPG from Com2uS and Polygon Games asks players to collect special Artifacts of Loux in order to save the world from darkness. Players will build a team of heroes, who will automatically attack enemies during battles. As battles progress, players will earn energy which can be spent to activate their heroes’ special skills. Players can collect additional heroes for their team over time, and they upgrade their heroes by spending other heroes as upgrade materials. Users can also collect special Runes as they play, which can be used to increase their heroes’ stats. In addition to a single-player campaign mode, Light: Fellowship of Loux offers boss raids, arena matches and more. 70 Seconds (Free on iOS, Android) – From Sab Games, 70 Seconds features 25 different timed mini-games. For example, one game may ask players to quickly tap circles as they appear in different places on the screen, while another may ask players to tap on numbers from smallest to largest as quickly as possible. Players begin with access to seven games, and they can unlock additional games using coins. Players can earn coins by playing games, or they can purchase coins via in-app purchase. Gamers can also earn free coins by watching video ads and completing other tasks.